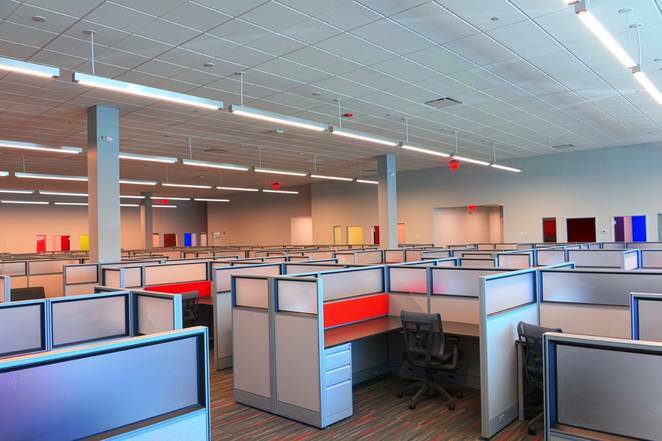 As the days become shorter and overall light levels fall, you can improve productivity in your business with well-designed artificial lighting. Good lighting won’t only help your employees to see what they’re doing, it will also help to meet their biological need for light and improve their wellbeing. A study from Germany found that, in companies with a high standard of interior design, productivity can increase by up to 36%. Other studies have found that 91% of people find direct and indirect lighting and vertically lit surfaces comfortable, compared with only 70% feeling comfortable in environments where there is only downward lighting. Not only are better lighting levels and designs good for wellbeing, the colour temperature of lighting also plays a role. Artificial lighting can be designed to correspond to the colour temperature at different times of the day. For example, at noon the sky’s colour is cool but at sunset it is a much warmer. Matching artificial light temperatures throughout the day can support our body’s natural rhythms, reducing stress and improving sleep. Please give us a call if you would like to improve the lighting design for the working environment in your business.